Code, software engineering and technology. Deploying applications in Kubernetes can be complicated. Even the simplest application will require creating a series of interdependent components (e.g.namespace, RBAC rules, ingress, services, deployments, pods, secrets …), each with one or more YAML manifests. Helm is the de-facto package manager for Kubernetes applications that allows developers and operators to easily package, configure, and deploy applications onto Kubernetes clusters. If you’re building an application that will run in Kubernetes, you should really look into leveraging Helm. In this tutorial we’ll show you how to build your first Helm chart and how to use [CND](https://github.com/cloudnativedevelopment/cnd#cnd-a-tool-for-cloud-native-developers) *to *develop your application directly in the cluster, saving you tons of time and integration problems. This tutorial assumes that you have some Kubernetes knowledge and that you have access to a cloud provider, or you can set it up locally. The official Kubernetes setup guide covers this topic extensively. For the purpose of this tutorial, I recommend you either deploy a remote cluster via Digital Ocean’s Kubernetes service or locally with Minikube. For OSX you can install it via brew by running the command below. You can also install it via curl. Once it’s installed, initialize it by running the command below. The full installation chart is available here. The easiest way to create a new chart is by using the helm create command to create the initial scaffold of your chart. Helm will create a new directory called mychart *with the structure shown *below. The default chart is configured to run an NGINX server exposed via a service with a ClusterIP. To access it externally, we’ll tell it to use a *NodePort *instead. Deploy the chart using the helm install command. The output of the install command displays a summary of the resources created, and it renders the contents of the NOTES.txt file. 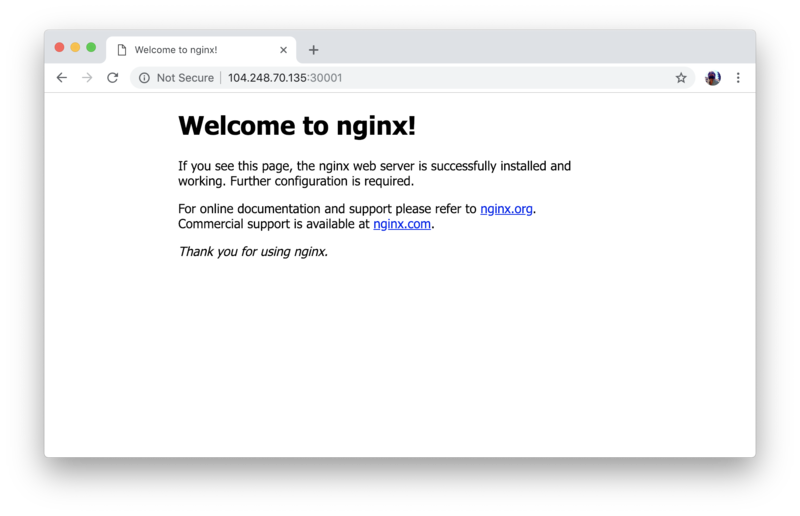 Run the commands listed there to get a URL to access the NGINX service. Instead of following that workflow, we’re going to save time and friction by developing our application directly in the cluster. The Cloud Native way. Cloud Native Development is THE way to develop Cloud Native Applications. Instead of wasting time and resources by developing locally and then testing in the cluster, we just do everything directly in the cluster. We open sourced[CND](https://github.com/cloudnativedevelopment/cnd) to make it easier than ever to become a Cloud Native Developer. Install the latest version of CND. The installation guide on the repo has instructions on how to do it for MacOS, Windows, and Linux. 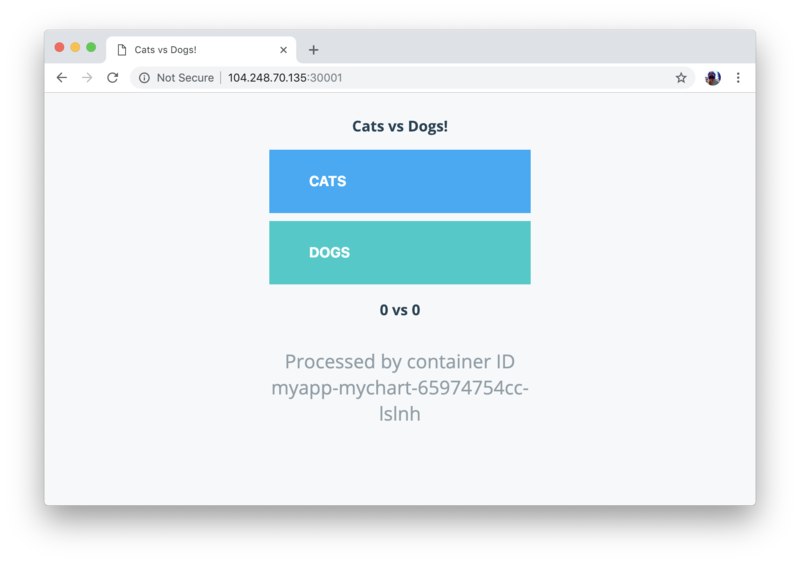 For the purpose of this tutorial, we’ll use a simplified version of Docker’s famous Voting App. Run the following command to get the code locally. Open a second terminal window, and go to the vote folder. From there, run the cnd createcommand to initialize your Cloud Native Development environment. This command will create a file called cnd.yml with the content displayed below. Run the cnd up to start your Cloud Native Development environment. Ready! Go to your local IDE and continue coding! At this point, your application is running directly in the cluster **(our github repo has an in-depth explanation of how this works). **Notice the processed bytext near the bottom, it’s your kubernetes namespace and pod name. Go back to your browser and reload your tab to see the application in action. Try it out a few times, just to make sure everything works. Now open the source of the application on your favorite IDE. Edit the file vote/app.py and change the option_a in line 8 from “Cats” to “Otters”. Save your changes. Go back to the browser, refresh the Voting App UI, and notice that your code changes are instantly applied. Try a few more changes. Once you are done developing, pressctrl+c on the terminal where cnd upis running to stop your environment (psst: Notice how you never used docker or kubectl while working on your app. Pretty cool no?). Run cnd down to restore the original deployment (this is so that helm can process the new changes). Build a docker image for the voteapplication and push it to the registry. Create a file named updated-values.yaml inside the mychartfolder. We’ll use this file to override the default configuration of the chart. Set the values of image.repository and image.tag to match your newly built image. Upgrade your application using Helm by running the command below. Open your browser, and verify that your application is running correctly. Once your application is ready, you can package by using the helm package command and even distribute it via a repo, or with Kubeapps. This article has a good explanation of the process. Helm is a great modern choice for deploying and managing applications. But developing charts and applications using the traditional developer workflow is slow and full of friction. Developing directly in the cluster makes the entire process a lot more efficient. CND is here to help you with that. Interested in improving your Kubernetes and Docker development workflows? Contact Okteto and stop waiting for your code to build and redeploy. Hi I'm Ramiro! I'm a software engineer, and entrepeneur, a tinkerer and a latino (in no particular order). I blog mostly about tech, my personal projects or stuff that excites me. Wecome!